Step 1) If you need to add bidders into the system on the fly, you will need to add them as an attendee. This section is located under Live Event Options > Attendees. Step 2) Click Add Attendees. You can add a single attendee as well as a bulk upload from this screen by clicking the pull down menu. Your pull down options include uploading your own XLS file, from your Tickets, or from Classy. Step 1) You will want to download our sample file and load your guest contact details into the file. Once that is complete you will import. Step 1) Select "Import from Sold Event" and from the next pull down your Event Name. 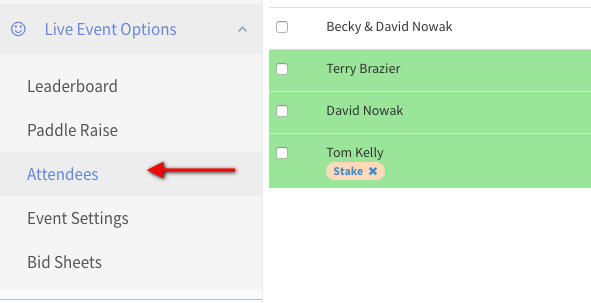 Step 2) Once you have selected your Event name you can select All attendees by clicking the check box located on the left side of First Name column. Once selected click "Import Attendee(s)"